As the second-largest provider of potable water in the state of Georgia, the Cobb County-Marietta Water Authority (CCMWA) uses the latest technology and innovations in water treatment to ensure optimal efficiency and safety in its operations. CCMWA operates two water treatment facilities: the James E. Quarles Treatment Plant in Marietta, which treats water from the Chattahoochee River, and the Hugh A. Wyckoff Treatment Plant in Acworth, which treats water from Allatoona Lake. Together, the treatment plants prepare water for wholesale distribution to 11 retail water suppliers, as well as industrial and institutional customers. The Wyckoff plant, built in 1965, has grown to keep pace with regional water needs in northwest Georgia and evolved to address public health and safety issues. While chlorine gas traditionally had been used for water disinfection, its hazardous potential became a real concern for treatment facilities across the country. CCMWA addressed this through a major investment that included the installation of an onsite sodium hypochlorite generation system at the Wyckoff plant in 2012. 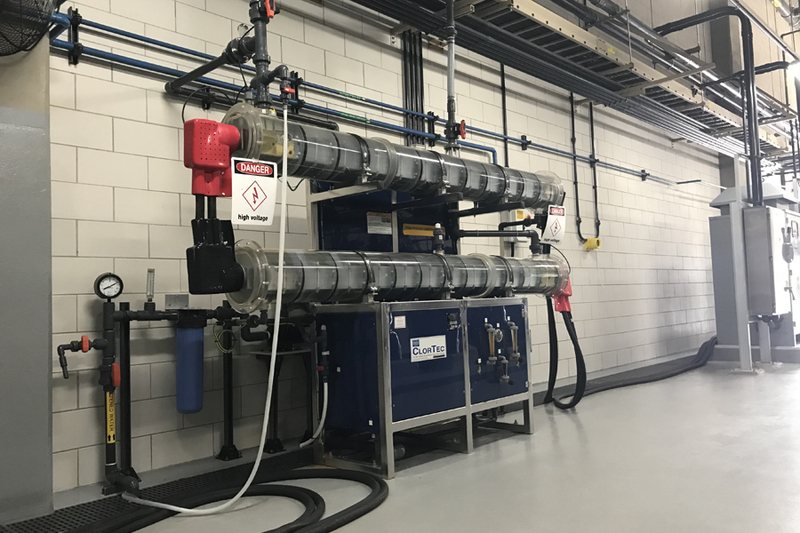 Following a review of available systems, CCMWA selected the ClorTec 2x CT1500 PPD OSHG system from De Nora Water Technologies. In numerous installations, this setup has offered benefits such as the elimination of bulk chemical storage, fewer disinfection byproducts, and a notable reduced threat to the safety of employees and the public at large. Delivered in August 2012, the system—consisting of the 1,500-lb-per-day onsite sodium hypochlorite generator and associated equipment—was a fit for the plants, as it provided the flexibility to meet the space restrictions and allow for expansion. Several years later, after experiencing consistent operational improvements thanks to the system, CCMWA determined it needed to expand the system by adding a third onsite generator. “We were very pleased with the two existing generators and their productivity, and were concerned that if one of them were to stop functioning properly, as can happen in the life cycle of this type of equipment, it would be difficult for us to maintain our preferred operational level and quality,” said Terry Wilson, division manager of the Wyckoff plant. As the technology has continued to develop in recent years, Wilson and his team also were attracted to the brine pump added to the ClorTec DN generator, which helps improve water pressure levels. The latest generation of De Nora’s onsite sodium hypochlorite generation system incorporates brine electrochlorination technology, allowing operators to accurately control and adjust the amount of brine supplied to the system. Replacing less efficient mechanical sensors, the new version also includes analog flow sensors for water and brine, as well as water temperature readings transmitted to the programmable logic controllers. It also offers high efficiency and the guaranteed lowest consumption of salt and electricity, with an upgraded instrumentation panel for greater operator control. The latest-generation ClorTec DN1500 PPD OSHG system incorporates new features, including an upgraded instrumentation panel for greater operational control. Installed in spring 2017, the additional 1,500-lb-per-day ClorTec DN generator now is part of a cycle through which the three generators alternate in use, two at a time. As CCMWA maintains its commitment to providing sustainable, reliable drinking water while ensuring public health and safety in the region, it has found a practical solution through onsite sodium hypochlorite generation. “Even in the high-demand season of summer, we’re pleased to report seven- to nine-hour run times and excellent production of potable water for our satisfied customers,” Wilson said.